The town of Narrabri is one of the principal towns in the north-west region of NSW. It is at the centre of an important rural and agricultural region, and the town itself has a growing commercial centre. It is on the Newell Highway between Coonabarabran and Moree, being 531 km north-west of Sydney and 240 m above sea-level. It is located within the Namoi River Valley, and this river is adjacent to the town. 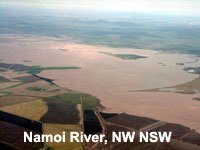 The word Narrabri is said to mean 'forked waters', which takes it’s name from the junction of the Namoi River and the Narrabri Creek. It is thought that the name derives from the language of the Kamilaroi people who were the original inhabitants of the land. On the eastern side of town you can see the rugged peaks of Mt Kaputar. There is also the Mt Kaputar National Park which is abundant with rugged hills and forests. To the west, the vast plains stretch for miles - almost to infinity! The land is used principally for the traditional products of wheat-growing and the raising of fat lambs and beef. 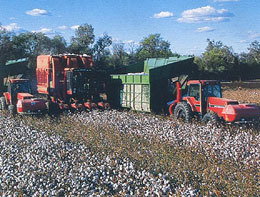 However since 1962, cotton has become increasingly important, and has now put Narrabri on the map! In 1818 John Oxley became the first European to set foot in the district, and was followed by Allan Cunningham, who explored the Boggabri Plains in 1825. The escaped convict George Clarke roamed the land, in what is now the Narrabri Shire, in the late 1820’s. Then upon his subsequent return to the more settled areas, his tales of a vast inland river prompted the expedition of Thomas Mitchell into the region. The opening of the inland to settlement then followed. The first squatters in the area were the Doyles - Andrew and his brothers - and they took up the 'Nurrabry' run in 1834. It was subsequently managed for them by convict stockman Patrick Quinn, who had been transported from Ireland. In those times, the living conditions were rough, and marauding Aboriginals were always a threat, along with the occasional bushranger. Following representations to the Crown, the site for the township of Narrabri was recommended in 1848 at what had become the major road junction of the inland. A hotel was licensed in 1858 and the town was proclaimed in 1860. A post office and police station were established next, but a catastrophic flood devastated the fledgling township in 1864. However this set-back didn’t delay the development of it too much, and a courthouse was opened the following year, along with a coach service. A public school opened in 1868, and the area was slowly opened up to farmers, who established wheat-growing there in 1873. As wheat growing became more established, the population climbed from 313 in 1871, to 1,977 by 1891. Bridges over the Narrabri Creek were built in 1877 and over the Namoi in 1879. The railway arrived at Narrabri West in 1882, and a settlement began to develop around it. Narrabri was declared a municipality in 1883, while early years of the twentieth century saw a steady growth in the rural industries of the area . A major soldier resettlement scheme was implemented at Edgeroi (24 km north) after World War II, which stimulated the growth of the population in the region. A major flood in 1955 devastated the town, but Narrabri West was unaffected. This separate entity was finally incorporated into Narrabri proper itself in 1981.